The New York City skyline is world famous. Just this image is an historic picture of hope for those around the world and a symbol of industry and progress in America. The subway system is legendary, a frequent subject in both fiction and the news. Yet some part of this amazing infrastructure may have become your personal nightmare. The attorneys at Frekhtman & Associates want you to know you’re not alone in navigating the complexities of New York’s premises liability laws after an accident. Here are some common ways injuries can happen through accident or negligence in New York. Learn how you can protect yourself and what you can do today to ensure any negligent party compensates you for your financial losses in the event of an accident. Throughout New York City, elevators provide around four million lifts on an average day. As a form of transportation, this makes elevators one of the safest modes of travel in existence. Nevertheless, if you’re one of the 17,000 people in the U.S. elevators injure each year, you probably have a different perspective. Elevators are generally safe because there are strict laws governing maintenance and inspection. Sometimes, however, a building manager or owner may neglect to properly maintain the elevator, or a malfunction may occur that results in you or someone you love’s injury or even death. Make sure the elevator is level with the floor before entering. Do not exit the elevator if it stops more than nine inches from the landing. Press the door open button to hold elevator doors from closing. Never use any part of your body to block an elevator door. New York City property owners are legally responsible for ensuring elevators on their premises are safe for use. If this did not happen in your case, you may need the help of an experienced NY attorney. He or she can help you determine if you may be eligible for compensation for medical bills and other expenses as a result of your injury. Your attorney should inspect the documentation from the inspections and maintenance reports, interview others who may have complained about the elevator in the past, and ensure that yours is not one of the cases that slips through the cracks. In 1892, Coney Island was the first city to have a working escalator. Escalators are now a norm; they ensure seamless transportation from one floor to another and help those who can’t manage stairs. When an escalator malfunctions, serious injury can result. Escalators can malfunction for many reasons including gaps between landings, broken or missing comb plates, loose screws, missing teeth in the steps, or sudden starts or stops. Most common injuries involve a piece of the victim’s clothing becoming caught in the mechanism, which can lead to terrible consequences. Lacerations, strains, broken bones, even brain or spinal cord injuries can result. Falling injuries also occur as loose screws or other parts catch on a person, or a sudden start or stop causes the rider to lose balance and fall. Check your shoelaces and those of any kids with you before taking an escalator. Hold securely to the handrail until exiting. Hold any scarves, coats, purses, or other loose garments close so they don’t catch on escalator mechanisms. Avoid distractions while riding the escalator, especially on entering and exiting. Even when exercising all proper precautions, something beyond your control may cause an accident. Those responsible for the escalator must maintain it properly, ensure a professional inspects it regularly, and adequately warn people from using it when it is not functioning properly. 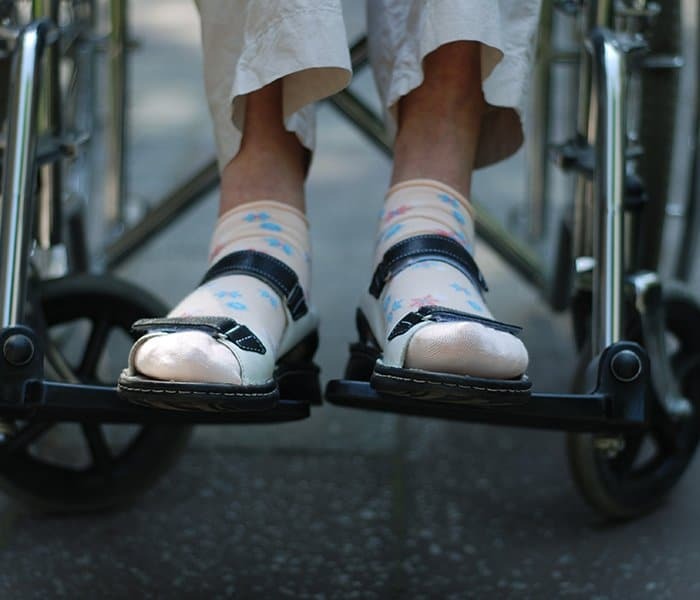 The attorneys at Frekhtman & Associates understand the horror the suffering that an escalator injury may cause you or a loved one, having worked with many others who have had similar experiences. You deserve to representation by an attorney who understands the unique issues involved in this type of case and who will provide the professional assistance you need. The ceiling over our heads is such a fact of life that we normally don’t consider it a risk. However, New York has a mix of new construction and older buildings dating back to the 1800s. Building owners have a responsibility to maintain their properties and ensure they are safe for use. Nevertheless, with over one million buildings in New York City alone, there will be places where owners have not properly repaired or maintained a building’s structure. If that affects the ceiling, those in the building may be in serious danger. Damage to ceilings that could cause them to fall often begins not with the ceiling itself but with plumbing or roofing problems. Water leaking between floors can weaken supports, dislodge ceiling tiles, and cause debris to fall, damaging property and potentially injuring anyone below. A ceiling that looks sound may have potentially dangerous damage that is invisible. Danger lurks where we can’t see it. Mistakes in product manufacture or improper installation may also be a factor in accidents. Injuries from falling ceilings may include head trauma, injuries to the neck or spine, cuts, and sprains. In addition to injury, property damage may also be significant. Lost wages from time missed from work or lost earnings from a business if your business roof fell may also result from the accident. Your loss affects not only you, but your loved ones, your coworkers, and others. A once stable area of life may now cause you fear and discomfort in every room you walk into that area. Don’t let this accident derail your life. Talk to one of our attorneys today. We can walk you through this process and handle the legal complexities of this area of the law. Pratfalls down stairs have been a staple of comedy for as long as there have been stairs, but, if a fall down the stairs hurt you, you likely don’t find it funny at all. Unlike movies or TV, which portray a fall down the stairs as a minor incident you can get up from and walk away, falls in real life often result in serious and even fatal injuries. The Centers for Disease Control and Prevention (CDC) reports that stair falls hospitalize over 800,000 people a year, resulting in $31 billion in medical costs. 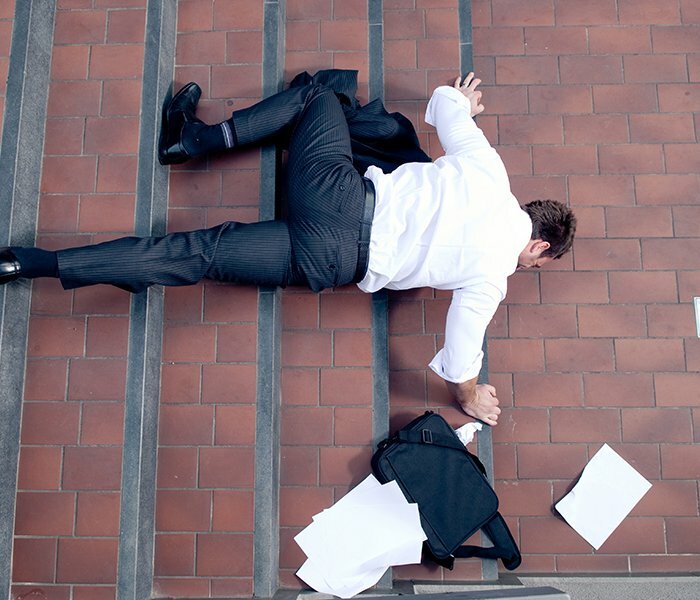 Falling on stairs is one of the most common causes of injury from falls. Injuries from these kinds of falls include broken wrists, arms, ankles and hips, and head injuries. Dying from a fall is the 3rd most common cause of accidental death. Tie your shoe laces securely to prevent tripping. Watch closely for debris or spills on the stairs. Always hold the handrail securely while ascending or descending stairs. Do not use stairs that appear to need repair. Even utilizing the best practices for safety on stairs may not be enough. Unseen damage or debris may cause you to trip and result in injury. Even what you may initially believe to have been a fall caused by your own carelessness or a loss of balance, may on closer inspection have been a result of a loose section of tread or a trip hazard you didn’t observe at the time. When the attorneys of Frekhtman & Associates look over your case, we go over repairs and maintenance records for the building, examine inspection reports, acquire any public surveillance videos of the area, and interview others who may have complained about the stairs or who also fell on the stairs. It’s a myth that if a defect in the infrastructure of a city, which the city’s government maintains, causes you injury, it’s impossible to secure compensation. Though suing a city or government isn’t as common, neglect by a government agency can still be a financial award for someone hurt by that neglect. While the grates that we walk on each day are generally safe and well-maintained, it does happen from time to time that grates are unsecure, and someone falls through or trips on a defective subway grate. Paying close attention as you walk for any larger than normal gaps or trip hazards. Avoiding any broken or overly-worn grates. Never circumventing protective barrier blocking your path over a grate. After a trip and fall from a grate that injures you or a loved one, you may need help. Your injuries may require treatment or even hospitalization, resulting in expensive medical bills and possible lost wages or other damages – all due to another’s negligence. Contact the attorneys at Frekhtman & Associates, and let us help you determine the facts of your case and what compensation you may be eligible to receive. Whatever the cause of your injury, you may be feeling frightened, hurt, and even angry, but you don’t have to feel alone. Our attorneys have experience in all manner of injury that results from infrastructure and maintenance problems. Escalators, elevators, stairs, buildings, and grates need regular care to ensure users are safe. If someone neglected that care, then that negligent party may owe you compensation for your medical bills, time away from work, and pain and suffering. Restoring your health should be your main concern, so leave the us the burden of litigation. Our compassionate team of attorneys want you to have the resources you need to recover and return to your life as quickly as possible.